Asbestos is a general name that applies to several types of fibrous silicate minerals. Historically, asbestos is best known for its resistance to flame and its ability to be woven into cloth. Because of these properties, it was used to make fireproof stage curtains for theaters, as well as heat-resistant clothing for metal workers and firefighters. More modern applications of asbestos take advantage of its chemical resistance and the reinforcing properties of its fibers to produce asbestos-reinforced cement products including pipes, sheets, and shingles used in building construction. Asbestos is also used as insulation for rocket engines on the space shuttle and as a component in the electrolytic cells that make oxygen on submerged nuclear submarines. Much of the chlorine for bleach, cleansers, and disinfectants is produced using asbestos products. The earliest known use of asbestos was in about 2500 B.C. in what is now Finland, where asbestos fibers were mixed with clay to form stronger ceramic utensils and pots. The first written reference to asbestos came from Greece in about 300 B.C. when Theophrastus, one of Aristotle's students, wrote a book entitled On Stones. In his book, he mentioned an unnamed mineral substance, which looked like rotten wood, yet was not consumed when doused with oil and ignited. The Greeks used it to make lamp wicks and other fireproof items. When the Roman naturalist and statesman Pliny the Elder wrote his comprehensive Natural History in about 60 A.D. , he described this fire-proof mineral and gave it the name asbestinon, meaning unquenchable, from which we get the English word asbestos. Although the fireproof qualities of asbestos continued to fascinate the scientific community for hundreds of years, it wasn't until the 1800s that asbestos found many commercial uses. The first United States patent for an asbestos product was issued in 1828 for a lining material used in steam engines. In 1868 Henry Ward Johns of the United States patented a fireproof roofing material made of burlap and paper laminated together with a mixture of tar and asbestos fibers. It became an immediate success. Large-scale mining of asbestos deposits near Quebec, Canada, began in 1878 and spurred the development of other commercial uses. By 1900 asbestos was being used to make gaskets, fireproof safes, bearings, electrical wiring insulation, building materials, and even filters to strain fruit juices. Technological developments in the early 1900s resulted in even more uses for asbestos. Many of the early plastic materials relied on asbestos fibers for reinforcement and heat resistance. Vinyl-asbestos tile became one of the most commonly used floor coverings and remained in use well into the 1960s. Automobile brake linings and clutch facings also used large amounts of asbestos, as did a multitude of building materials. After World War II, the use of asbestos in products continued to expand. Heart surgeons used asbestos thread to close incisions, Christmas trees were decorated with asbestos artificial snow, and a brand of toothpaste was marketed using asbestos fibers as an abrasive. The widespread use of asbestos was not without a dark side, however. Health problems associated with exposure to airborne asbestos particles had been noted since the early 1900s, and resulted in the passage of the Asbestos Industry Regulations of 1931 in England. By the mid-1960s, health problems began to surface among shipyard workers who handled asbestos insulation during World War II. In the United States, the problem reached the crisis stage by the 1970s, forcing the Environmental Protection Agency (EPA) to place severe restrictions on the use of asbestos. Although the EPA lifted the ban for certain kinds of asbestos in 1991, the public's faith had been severely shaken, and most manufacturers had voluntarily removed asbestos from their products. As a result, asbestos usage in the United States fell from about 880,000 tons/yr (800,000 metric tons/yr) in 1973 to less than 44,000 tons/yr (40,000 metric tons/yr) in 1997. In other countries, asbestos products are still widely used, especially in the construction industry. Worldwide usage of asbestos in 1997 was estimated at about 2.0 million tons/yr (1.8 million metric tons/yr). Most of this asbestos is used to make asbestos-reinforced concrete products, where the asbestos fibers are locked within the concrete. Asbestos mining operations are found in 21 countries. The leading producers of asbestos are Russia (formerly the USSR), Canada, Brazil, Zimbabwe, China, and South Africa. Smaller deposits are found in the United States and several other countries. There are six types of asbestos: actinolite, amosite, anthophyllite, crocidolite, tremolite, and chrysolite. The first five types are known as amphiboles. They are characterized by having very strong and stiff fibers, which makes them a serious health hazard. Amphibolic asbestos fibers can penetrate body tissue, especially in the lungs, and eventually cause tumors to develop. The sixth type of asbestos, chrysotile, is known as a serpentine. Its fibers are much softer and more flexible than amphibolic asbestos, and they do less damage to body tissue. All six types of asbestos are composed of long chains of silicon and oxygen atoms, locked together with various metals, such as magnesium and iron, to form the whisker-like crystalline fibers that characterize this mineral. Chrysotile is the most commonly used type of asbestos and accounted for about 98% of the worldwide asbestos production in 1988. It is usually white, and is sometimes known as white asbestos, although it can also be amber, gray, or greenish in color. Most chrysotile fibers are about 0.25-0.50 in (6.4-12.7 mm) long and are usually added to concrete mixes to provide reinforcement. Only about 8% of chrysotile fibers are long enough to be spun into fabric or rope. Amosite, sometimes called brown asbestos, accounted for about 1% of worldwide production in 1988. It often has a light brown tinge, but is also found in dark colors, as well as white. Amosite has coarse fibers that are about 0.12-6.0 in (3.0-152.0 mm) long. The fibers are difficult to spin into fabric or rope and are mostly used as an insulating material, although that use is banned in many countries. Crocidolite, sometimes called blue asbestos, accounted for the remaining 1% of world-wide production. It has a bluish tinge, and its fibers are about 0.12-3.0 in (3.0-76.0 mm) long. Crocidolite has very high tensile strength and excellent resistance to chemicals. One of its uses is as a reinforcement in plastics. The other three types of asbestos—anthophyllite, actinolite, and tremolite—have no significant commercial applications and are rarely mined. 1 Chrysoltile asbestos deposits are usually located using a magnetic sensor called a magnometer. This method relies on the fact that the magnetic mineral magnetite is often found near asbestos formations. Core drillings are used to pinpoint the location of the deposits and to determine the size and purity of the asbestos. Most chrysotile asbestos mining operations are conducted in an open-pit mine. A spiraling series of flat terraces, or benches, are cut into the sloping interior sides of the pit. These are used both as a work platform and as a roadway for hauling the ore up and out of the pit. The asbestos ore deposits are loosened from the surrounding rock by careful drilling and blasting with explosives. The resulting rocky debris is loaded into large rubber-tired haul trucks and brought out of the mine. Some operations use an excavation technique called block caving, in which a section of the ore deposit is under-cut until it crumbles under its own weight and slides down a chute into the waiting haul trucks. The ore contains only about 10% asbestos, which must be carefully separated from the rock to avoid fracturing the very thin fibers. The most common method of separation is called dry milling. 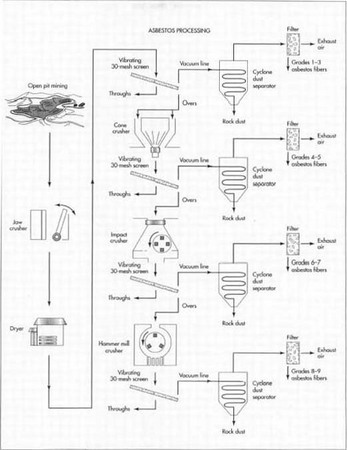 In this method, the primary separation is done in a series of crushing and vacuum aspirating operations in which the asbestos fibers are literally sucked out of the ore. This is followed by a series of secondary separation operations to remove rock dust and other small debris. 2 The ore is fed into a jaw crusher, which squeezes the ore to break it up into pieces that are 0.75 in (20.0 mm) in diameter or less. The crushed ore is then dried to remove any moisture that may be present. 3 The ore falls on the surface of a vibrating 30-mesh screen, which has openings that are 0.002 in (0.06 mm) in diameter. As the screen vibrates, the loosened asbestos fibers rise to the top of the crushed ore and are vacuumed off. Because the crushed ore is much denser than the fibers, only the very smallest rock particles get vacuumed off with the asbestos. 4 The very fine silt and rock particles that fall through the vibrating screen are called throughs or tailings and are discarded. The crushed ore pieces that remain on the screen are called overs and are moved to the next stage of processing. The crushed ore from the first screen is fed through a second crusher, which reduces the ore pieces to about 0.25 in (6.0 mm) in diameter or less. The ore then falls on another vibrating 30-mesh screen and repeats the process described in steps 3 and 4. 5 The process of crushing and vacuum aspiration of the asbestos fibers is repeated twice more. Each time the pieces of ore get smaller until the last asbestos fibers are captured and the remaining ore is so small that it falls through the screen and is discarded. This four-step process also separates the asbestos fibers by length. The longest fibers are broken free from the surrounding rock in the first crusher and are vacuumed off the first screen. Shorter length fibers are broken free and captured on each successive set of crushers and screens, until the shortest fibers are captured on the last screen. 6 The asbestos fibers and other material captured from each screen are carried suspended in a stream of air and run through four separate cyclone separators. The heavier debris and rock dust particles fall to the center of the whirling air stream and drop out the bottom of the separators. 7 The air then passes through four separate sets of filters, which capture the different length asbestos fibers for packaging. Asbestos fibers are graded according to several factors. One of the most important factors is their length, since this determines the applications where they may be used and, therefore, their commercial value. The most common grading system for chrysotile asbestos fibers is called the Quebec Standard dry classification method. This standard defines nine grades of fibers from Grade 1, which is the longest, to Grade 9, which is the shortest. At the upper end of the scale, Grades 1 through 3 are called long fibers and range from 0.74 in (19.0 mm) and longer down to 0.25 in (6.0 mm) in length. Grades 4 through 6 are called medium fibers, while Grades 7 through 9 are called short fibers. Grade 8 and 9 fibers are under 0.12 in (3.0 mm) long and are classified by their loose density rather than their length. Other factors for establishing the quality of asbestos fibers include tests to determine the degree of fiber separation or openness, the reinforcing capacity of the fibers in concrete, and the dust and granule content. Specific applications may require other quality control standards and tests. It is now generally accepted that inhalation of asbestos fibers can be associated with three serious, and often fatal, diseases. Two of these, lung cancer and asbestosis, affect the lungs, while the third, mesothelioma, is a rare form of cancer that affects the lining of the thoracic and abdominal cavities. It is also now generally accepted that different types of asbestos, particularly the amphiboles, pose a greater health hazard than chrysotile asbestos. Finally, it is recognized that other factors, such as the length of the fibers and the duration and degree of exposure, can determine the health hazard posed by asbestos. In fact some studies have shown that some asbestos-induced lung cancers only occur when the exposure is above a certain level of concentration. Below that threshold, there is no statistical increase in lung cancer over that found in the general population. Although not everyone agrees with these findings, overall concerns about the potential adverse health effects of inhaling asbestos fibers have led to stricter regulations on the amount of airborne asbestos allow-able in the workplace. These regulations vary from one country to another, but they all mandate significantly lower levels than previously found. In the United States, the Occupational Health and Safety Administration (OSHA) set the maximum permissible exposure to fibers longer than 0.005 mm at 0.2 fibers/cubic centimeter during an eighthour workday or 40-hour work week. Airborne asbestos levels in the general environment outside the workplace are many times lower and are not considered a hazard. Asbestos is still an important component in many products and processes, although its usage is expected to remain low in the United States. The stricter exposure regulations and improved manufacturing and handling procedures now in place are expected to eliminate health problems associated with asbestos. Alleman, James E., and Brooke T. Mossman. "Asbestos Revisited." Scientific American (July 1997): 70-75.